LOVE. All of a sudden I’m very much in the mood for color. Blue, yellow, orange, red, purple, coral, hot pink, seafoam green.. you name it, I want it all! Inspiration from Tommy Ton & Phil Oh. This entry was posted in Fashion Week, Inspiration by Carolina Engman. Bookmark the permalink. Also love the yellow strands of the woman! Im loving all these block colours at the minute !! I’m in the mood for color as well! Great shots! oh so fabulous! the yellow hair is striking. Great selection, that Celine clutch is stunning! 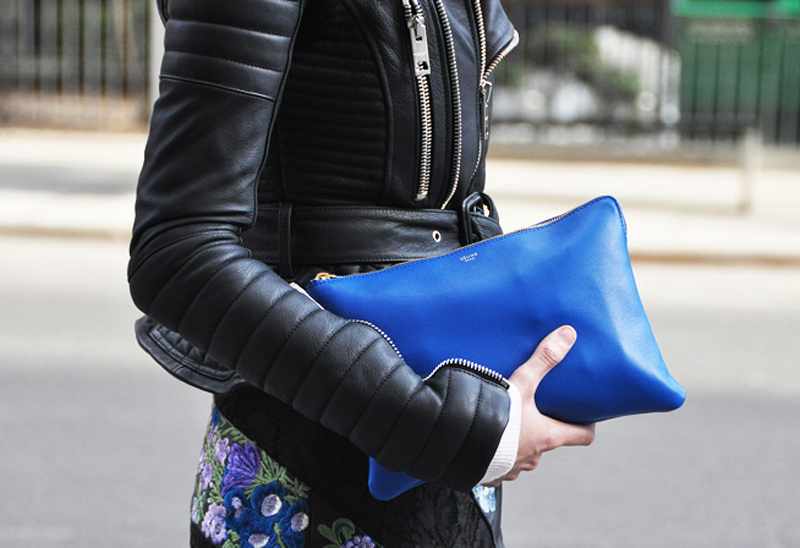 love the royal blue celine clutch. unfff, all i wanna do is shop now. for big bright colourful accessories! Everything is so fun and zippy! Wish spring will be here soon! that blue bag is my favorite! love it. Definitely, evidenced by S/S FTW 2011, color blocking is going to dominate! I’m so excited to mix neons and prints and colors! So maximalistic! Great looks! LOVEEEE that green coat. I am loving color too! i love the second image a lot as well as that girls hair in the third image. Why doesn’t the world wear more colour?!! Love the checks and stripes in the second image. I love the, I believe it’s Burberry, jacket in the first photo and that blue clutch is really beautiful! lovely pictures and colors ! amazing photo’s ! I love the colours, but if I go shopping I always come home with black, grey, brown etc ..
Iso want this first bag :))) Great pics! M.
vÅ¡etky kabelky sÃº perfektné ale tÃ¡ prvÃ¡ je dokonalÃ¡ ♥ chcem ju! Gorgeous pics! Love your blog. gillar verkligen den magnestiska blåa färgen på clutchen! vilka underbara bilder här. The first bag is so pretty!!! STUNNING! I’m with you, craving colors right now. It needs to be spring, asap! I’m loving all the color as well, especially the electric blue and tom binns jewelery awesome. absolutely need everything on the first photo!!! I loove all these bright colour so much. I just got red pants for myself and they make me want summer to be even sooner. than blue clutch is gorgeous by the way. The blue clutch in the first photo is really amazing!! lovely pics, I love the clutch ! what the hell would we do without jak & jil and street peeper?! i mean really..
first and second pic…so awesome! love the texture of that leather jacket! I love the use of colours! Hela den här månaden har jag varit inne på färg, det piggar upp när det ligger ett stort täcke med vit snö utanför fönstret.. I know exactly how you feel about colour! It makes me want it to be summer even more! I couldn’t agree more!! I’m dying for a bright orange bag! The first pic is my fav. The Burberry jacket (99.9% sure it is one) and the cobalt clutch. Simply perfect! 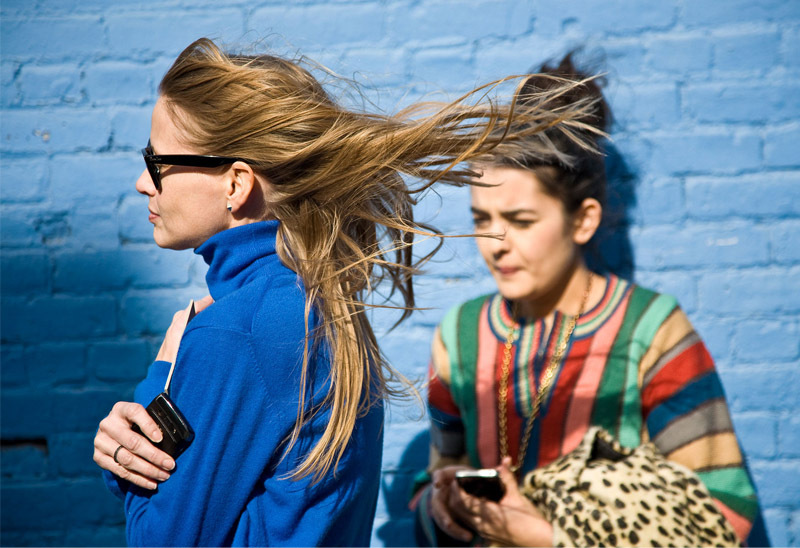 Tommy Ton is a master in taking fashion street photos. i love his point of view! Absolutely rad, from all angles. The blue bag on the first pic is beautiful! I’m in looove! It’s so exciting to see colour start coming out this time of year! My fave is the second picture! Tommy + Phil have done an amazing job of catching true color. The second picture is my favorite. Superb talent. The wind picture is also breathtaking. I love this post- the colours are lovely.